Berlin: Timo Werner and Yussuf Poulsen both scored twice as RB Leipzig brushed aside Mainz 4-1 on Sunday to strengthen their hold on a top-four place in the Bundesliga. Ralf Rangnick's men went into the game reeling after a surprise elimination from the Europa League group stage in midweek and last weekend's 3-0 loss to Freiburg. 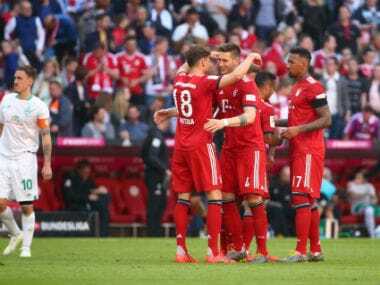 But Leipzig produced a strong performance at the Red Bull Arena to close to two points behind second-placed Borussia Moenchengladbach and Bayern Munich in third, although unbeaten Borussia Dortmund remain nine points clear at the top of the table. Leipzig face Bayern at the Allianz Arena on Wednesday with a chance to move into the top three. "We're happy that we won, we played well," Werner told Sky. "In Munich, it's a tough game, but we want to try and win there." Any disappointment about recent results was quickly put to one side as Danish international Poulsen struck twice inside the opening 20 minutes. The 24-year-old stretched out a leg to volley home Kevin Kampl's 14th-minute cross, before tapping in from close range after good work by Werner. Karim Onisiwo's header before half-time gave Mainz hope, but two fine individual strikes by Werner late on took him to 10 league goals this season and sealed the win in style. 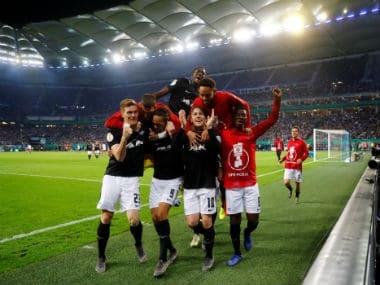 Fifth-placed Eintracht Frankfurt edged out Bayer Leverkusen 2-1 later on Sunday to stay only two points behind Leipzig. 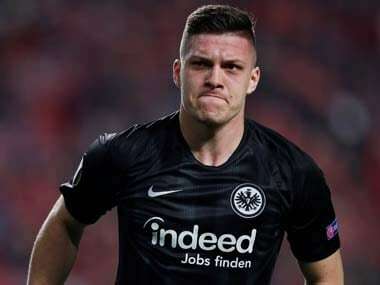 Danny da Costa finished off a fine team move to put Eintracht ahead in the 28th minute, and Filip Kostic bundled home before the hour mark to double the lead. Karim Bellarabi pulled one back midway through the second half, but Adi Huetter's home side closed out victory to end a run of two consecutive defeats.